This round smartwatch features a circular Plastic OLED display which uses the entire watch face, is powered by a Qualcomm Snapdragon 400 processor and runs Android Wear. LG Electronics will show its first round smartwatch next week at IFA 2014 in Berlin, but they unveiled its specs and features earlier today. 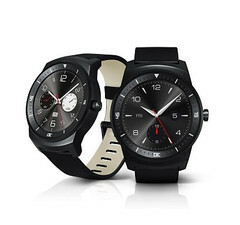 The official press release reveals that "The LG G Watch R is the world’s first watch-style wearable device to feature a circular Plastic OLED (P-OLED) display and utilizes 100 percent of its watch face." Same as Samsung's upcoming Gear S smartwatch, the G Watch R is IP67-certified for protection from water and dust. It will only be available in black and its pricing and date of release have not been announced yet. The G Watch R will be present at IFA 2014 in Hall 11.2 of Messe Berlin between September 5 and September 10.